The wall became the eye of a storm in 2015 after a 7-year-old male elephant that had reportedly died of “severe haemorrhage” in May that year from violently thrusting against the wall. 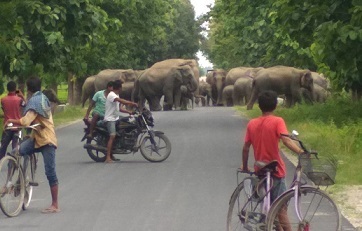 The Supreme Court of India on Friday dismissed an appeal filed by Numaligarh Refinery Ltd (NRL) and ordered demolition of the entire 2.2 km boundary wall blocking an elephant migration corridor in Deopahar Reserve Forest in Golaghat. The apex court said that “Elephants have first right on forest”. The same year, environmentalists captured videos showing elephants trying to cross the high boundary wall. The green crusaders then started demanding demolition of the wall built by the oil refinery. It was alleged that the wall and the refinery township were being built illegally in a “No Development Zone” declared by the Ministry of Environment, Forest and Climate Change (MoEF) in 1996. In August 2016, the National Green Tribunal (NGT) ordered NRL to demolish the entire length of the wall within a month. But only a 289-metre stretch was demolished. As per reports, the NRL challenged the NGT order, saying the entire wall need not be demolished as it is not a part of Deopahar Reserve Forest in Golaghat. Gauhati High Court has stayed any further demolition of the Numaligarh Refinery Limited (NRL) boundary wall as ordered by the National Green Tribunal (NGT) last month. The NRL claimed it had paid Rs 25 lakh to the State Forest Department, which will be kept in a separate bank account for restoration of the area and for the improvement of the surroundings adjoining the NRL complex and to reduce man-animal conflict especially man-elephant conflict.